The countdown has begun! In less than 60 days, The Summer of Sunshine and Margot will be out in hardcover, ebook, and audiobook. My webmaster has put a fun countdown clock on the home page at SusanMallery.com, so check in anytime you're wondering, "How long now? How long now?" Give a gift to future-you by preordering today. The book comes out on June 11, just in time for summer vacations! 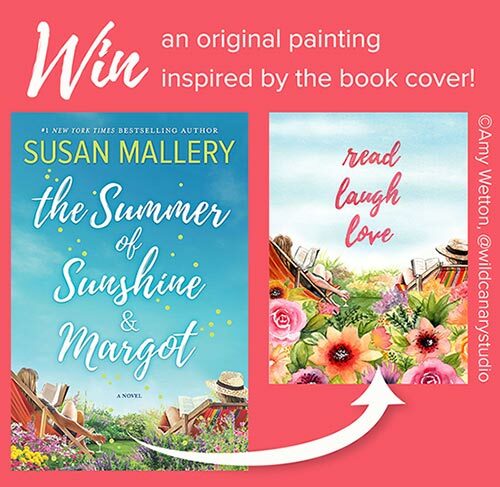 To help get you revved up for the new book, Harlequin commissioned an original watercolor painting by artist Amy Wetton of Wild Canary Studio, inspired by the gorgeous cover of The Summer of Sunshine and Margot! A lucky reader will win this one-of-a-kind piece of art, signed by me. I’ll confess, I’m going to be a little jealous of the winner.